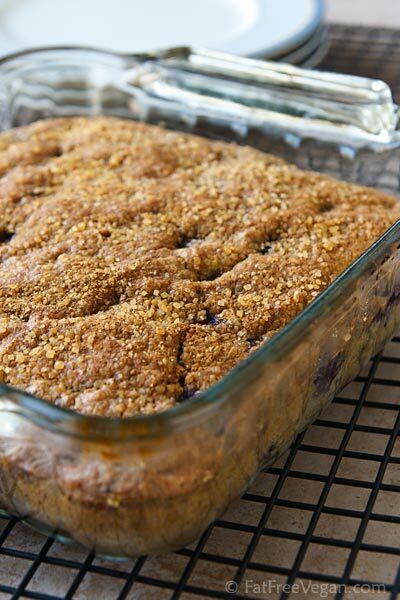 Lightly sweet and subtly spiced, this low-fat blueberry coffee cake can be made with fresh or frozen blueberries for a treat you can make year-round. Confession: My freezer is full of bulging gallon bags of the blueberries that we picked this summer, and rather than feel grateful that I’ll have blueberries all year round, I often feel pressured just to eat the darn things up so I can have my freezer space back. I want to be making Octobery desserts with the two exotic pumpkins that I just bought but feel compelled to use blueberries every chance I get. Last weekend I made this blueberry coffee cake for my daughter E and her friend’s breakfast, and when E saw it she said, “Why didn’t you make a pumpkin cake?” It looks like being ungrateful for what you have runs in the family! Still, E and her friend ate the whole cake, except for the 3 pieces D and I managed to grab. It’s a breakfast or coffee cake, so it’s not supposed to be super sweet (though try telling that to E, who poured agave nectar over hers because she thought it wasn’t sweet enough). If you have blueberries in your freezer, you can enjoy this little taste of summer when it’s cool enough to want to turn the oven on. Who wouldn’t be grateful for that? 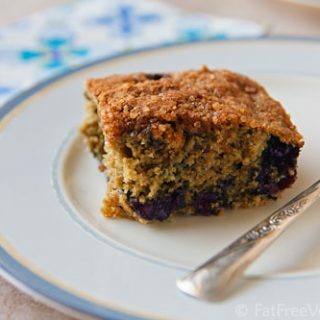 Lightly sweet and subtly spiced, this low-fat breakfast cake can be made with fresh or frozen blueberries. If using frozen, measure first and then defrost. Put the oats into a blender and grind until they are fine. Stir a couple of times to make sure that they're uniformly ground. Mix the oat flour with the other dry ingredients. Stir in 1/4 cup of the blueberries. Put the remaining cup blueberries into a blender or food processor with the water. Pulse (quickly turn on and off) to coarsely chop the blueberries, but do not completely puree. Make a well in the center of the dry ingredients and pour in blueberry mixture and other wet ingredients. Stir until moistened and completely combined, but don't over-mix. Pour into the prepared pan (batter will be thick). Mix together the sugar and cinnamon topping, and sprinkle it over the top. Bake for 25-35 minutes, until a toothpick inserted in the middle comes out clean. Allow to cool for at least 15 minutes. Eat and celebrate! For a slightly lighter--but not fat-free--cake, add one tablespoon canola oil with the wet ingredients. This adds 14 calories and 1.5 grams of fat per serving. I know this vegan, however if I chose to use egg how many eggs would I need? I am not vegan I just follow a diet that doesn’t include meat very often thanks for the recipes!! I just want to say I would love to see some recipes that are for people with allergies to cinnamon. Mace is a substitute but changes the taste dramatically and not always favorable. This sounds amazing! My daughter needs gluten free, which is new since this past summer. Suggestions for making this GF? You should be able to substitute a gluten-free flour blend for the flour. You can buy one (find one that doesn’t have baking soda or powder added) or do a search to find a recipe to make your own. Gluten-free flours work best when several are blended because they have different properties, but I’m not an accomplished gluten-free baker, so I don’t have a recipe of my own to recommend. I tried making this today. Was looking for recipes using flours other than wheat and landed up on your page. The cake looks wonderful, even when cut and tastes good but unfortunately has a gooey feel. Is it supposed to be like that? I used flaxseed instead of Ener- G Egg Replacer. I ‘ve never used flaxseed as a substitute for egg before so I don’t know what to expect. A tip for those who ended up with a purple cake – mine didn’t! I used fresh berries and used a knife to chop them coarsely – each berry into 4-6 pieces. I added the water to the flour and mixed, adding the berries last. Could that be the reason for the gooey texture?? Fran, I suspect the flaxseed is the culprit. It doesn’t contain any leaveners like Ener-G, so instead of helping the cake rise, it thickens and gets gummy. I hope it’s still edible, though! Thanks for another fantastic recipe! I used ground flax in place of the egg replacer and didn’t run into any problems. The cake came out so moist and flavorful and the crunchy topping is perfect. I want to send riffs link to a friend bit cannot figure out how to do that, Even from the desktop version… Help! 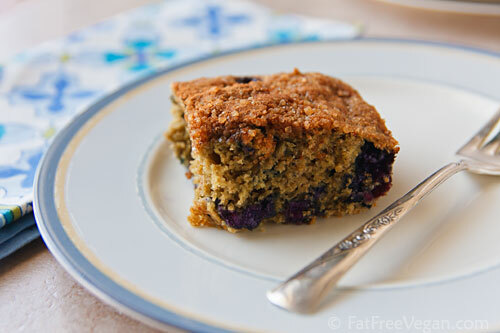 I’m not sure what the problem is, but the link to this post is https://blog.fatfreevegan.com/2010/10/blueberry-breakfast-cake.html Hope that helps! I figured it out thanks! Susan, this is superb! I modified a bit, used 1T ground flax in with the oats I ground up, put the cup of blueberries in the dry ingredients while frozen, and the 1/4 cup in the blender, used one 🍌 instead of applesauce, used almond flavor instead of vanilla. Made a double batch the cake is just like cake, very fluffy and not too sweet. Thank you!